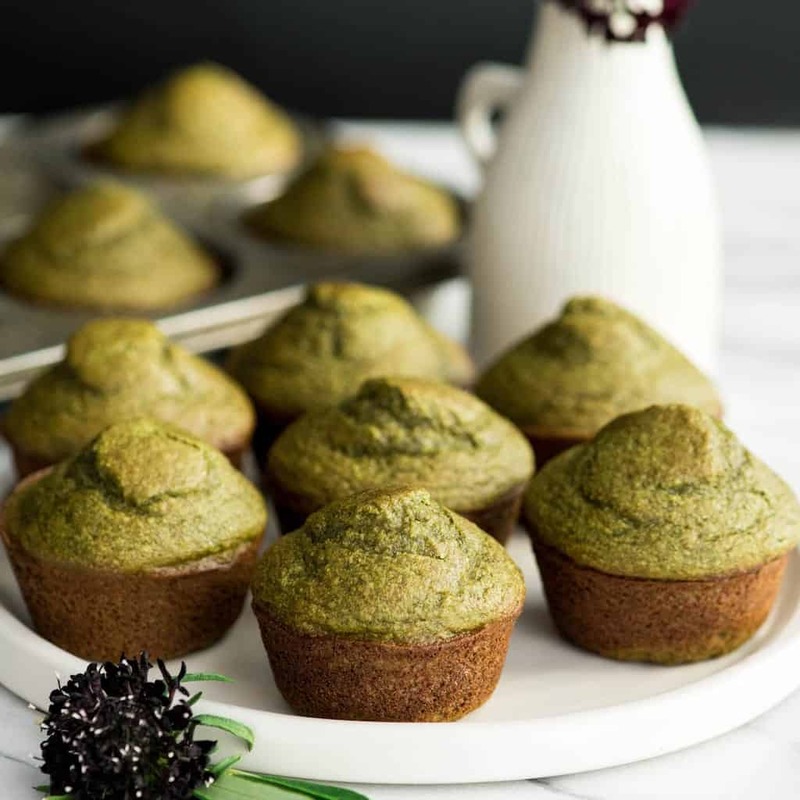 These blender Spinach Banana Muffins are an easy, healthy, freezer-friendly breakfast recipe full of fruit and veggies! They are gluten-free, dairy-free and have no refined sugar! This post was originally posted on August 1st, 2016 but has been refreshed with new photos and a video! You all know I have a thing for hiding vegetables in baked goods. Usually, my veggie of choice is zucchini, but today I’m mixing things up a bit! 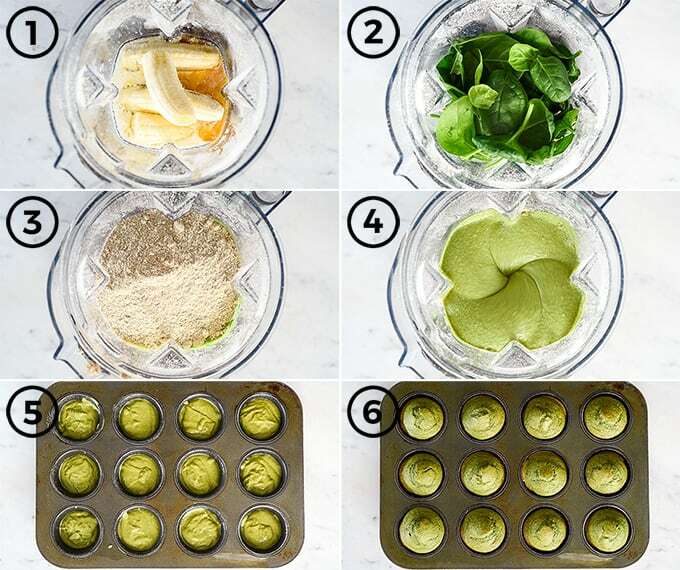 This recipe for Spinach Banana Muffins is healthy, delicious and easy! My kids love them because they’re green! We even call them “Hulk muffins,” which my son thinks is the coolest things ever. Because what kid wouldn’t want to eat a muffin named after a super cool super hero? I love making these for my family because they’re a breakfast I feel great about serving them! 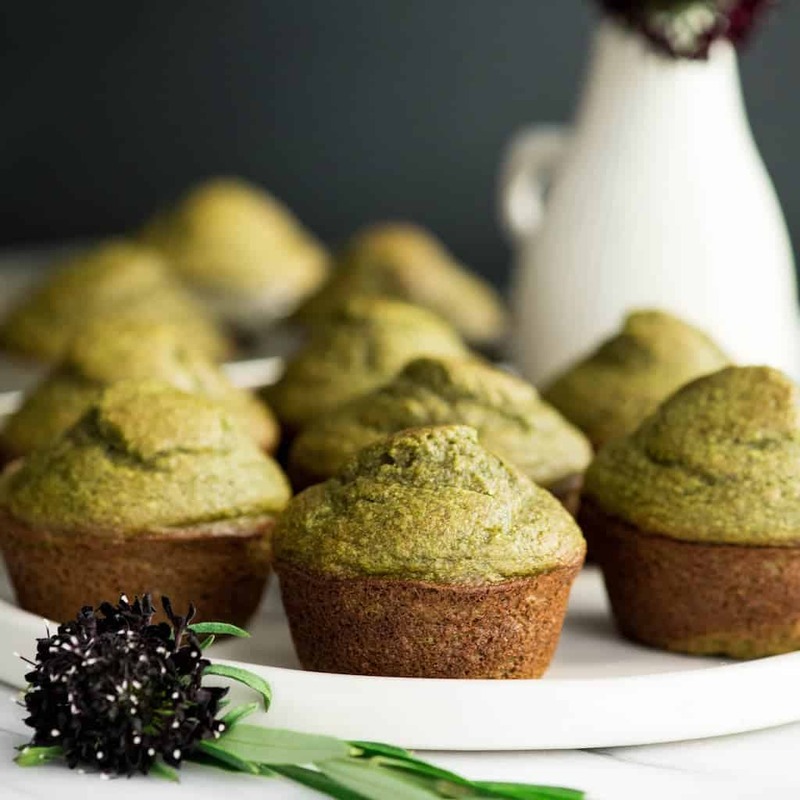 These Spinach Banana Muffins are gluten-free, refined-sugar free, dairy-free and vegan-friendly! 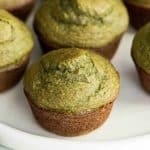 They taste like a green smoothie but in muffin form! I used to stress about feeding my kids veggies. I so desperately wanted them to beg me for giant plates of stir-fry and get excited over skewers full of colorful grilled vegetable-goodness. This is why my husband is so wonderful (well, one of the many reasons). He helps me see reality…that even though our kids don’t go gaga over a bowl full of roasted Brussels sprouts, the hard work has paid off and they really are great eaters. They just know that lunch and dinner always include one fruit and one veggie. I ask them “what veggie do you want” (as opposed to, “do you want a vegetable?”) and they get to choose. It’s usually carrots or cucumbers (and always raw), but I am perfectly fine with that. Me: You’re right Gabe, you can have only pizza for dinner tonight. But I would be happy to get you some veggies if you’d like! Gabe: No! I want to only eat pizza! BETHANY! We get to only eat pizza and no veggies! LOL LOL! I love my kids! And I love that less-than nutritious eating is considered a special treat and not the norm for them! Plus, on days when I know we’re having a “pizza only” type of dinner, I can feed them Spinach Banana Muffins for breakfast! They get a healthy serving of fruits and veggies without even noticing! Zero stress! Total deliciousness! Complete win! 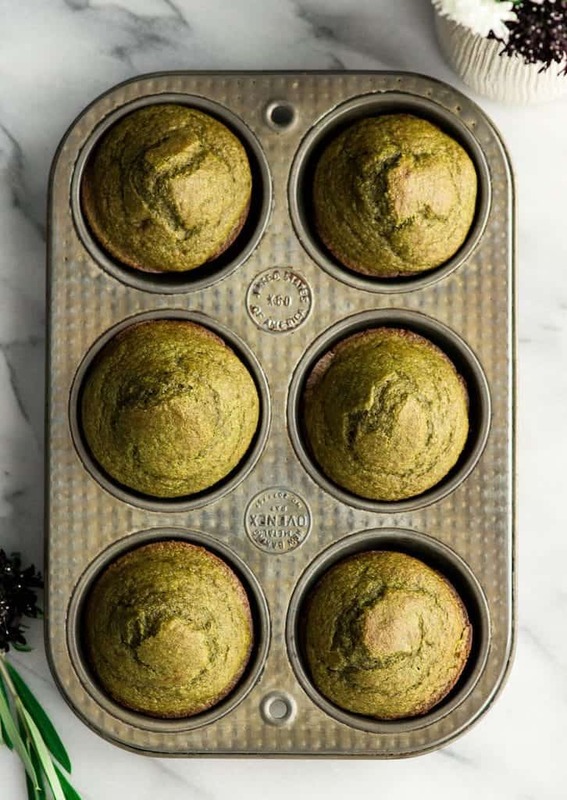 The best way to make these Spinach Banana Muffins is to use a high-powered blender, like the Vitamix! 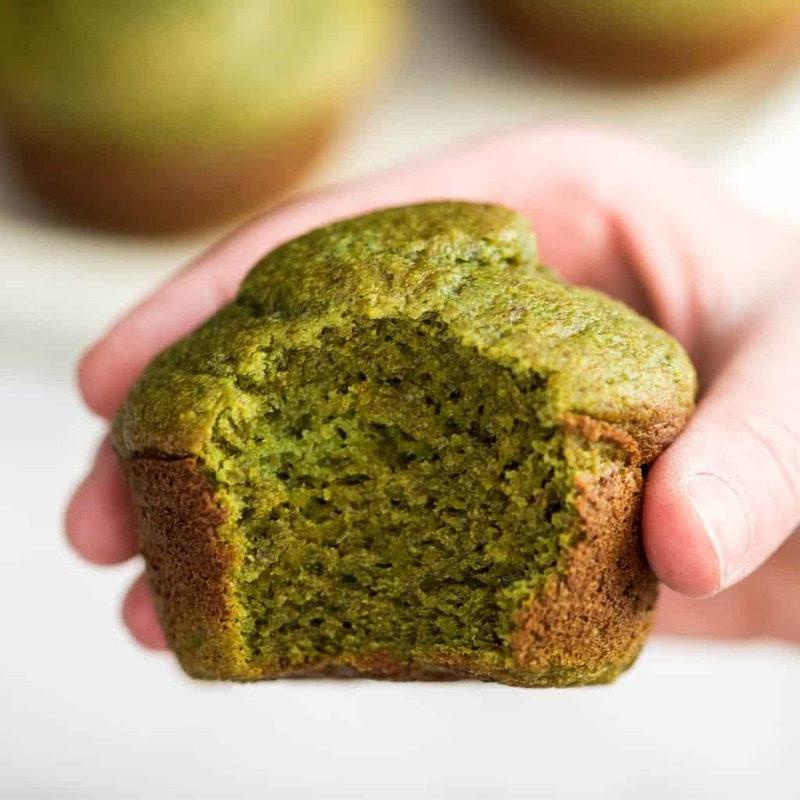 Using a Vitamix to thoroughly blend the ingredients in these Spinach Banana Muffins results in a final product that has zero traces of spinach, well except for the awesome green color! Blend dry ingredients then set aside. To make these muffins…start by putting the oats into your clean, dry Vitamix and turn them into oat flour! Add the rest of the ingredients, blend and set aside. Blend wet ingredients. When blending anything in the Vitamix, always add the liquid first! In this recipe, start by adding the liquid ingredients, banana and spinach and blend until smooth before adding the dry mixture! Freeze. After baking, let the muffins cool and then freeze in an airtight container. To reheat, simply warm in the microwave for 30-60 seconds per muffin! Ground Flaxseed: You may substitute equal amounts of almond meal or old-fashioned oats (ground into flour) for the flaxseed. Coconut Sugar: You may use any granulated sugar of your choice! I do not use sweeteners, but if you wanted to experiment with stevia (or a similar product) I recommend using a variety that is meant to be a 1:1 substitute for granulated sugar. Almond milk: you may use any non-dairy milk to keep the recipe dairy free. Or you may use regular milk! Coconut Oil: You may substitute vegan butter (like Earth Balance), regular butter, or ghee! Eggs: For vegan version substitute the 2 eggs with 2 TBS ground chia seeds and 5 TBS water. 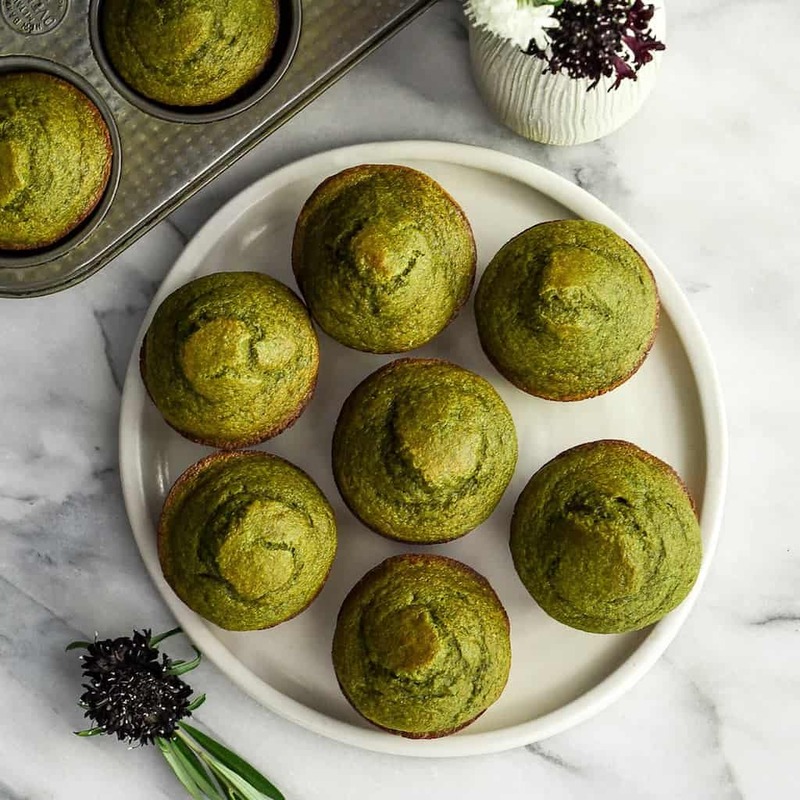 These blender Spinach Banana Muffins are an easy, healthy, freezer-friendly breakfast recipe full of fruit and veggies! 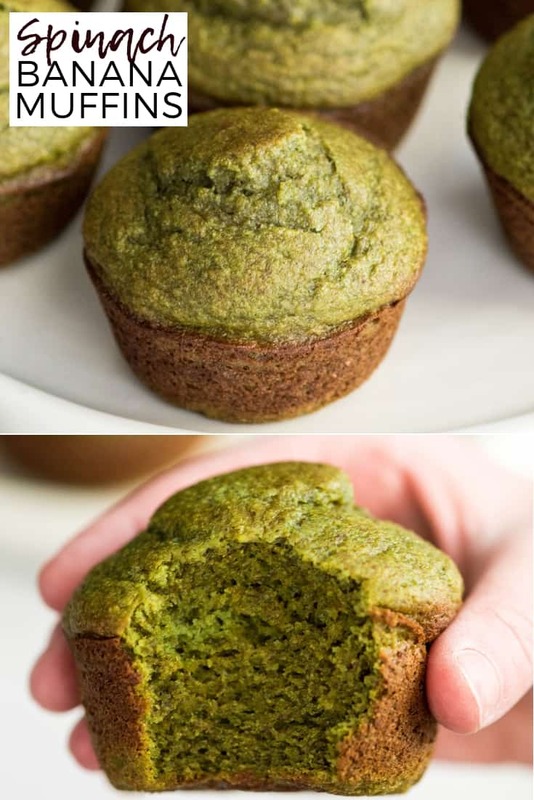 We call them "hulk" muffins because of their fun, naturally green color! They are gluten-free, dairy-free and have no refined sugar! Preheat oven to 375 degrees F. Grease or line a muffin tin. Put 2 cups of old-fashioned oats in your blender (Vitamix) and blend until the oats achieve the texture of flour. Transfer to a medium mixing bowl. Add the rest of the dry ingredients to the oat flour (ground flaxseed, baking powder, baking soda, salt, cinnamon and sugar). Set aside. Add almond milk to the blender followed by 2 cups of spinach. Blend together until completely smooth and homogenous. Add bananas and coconut oil and blend until smooth. Pour wet ingredients to dry mixture and stir to combine (making sure there are no lumps)! Fill each well in your muffin tin with ¼ cup of batter. Bake for 20-25 minutes or until toothpick comes out clean and the top springs back when touched. **for vegan version substitute 2 eggs with 2 TBS ground chia seeds and 5 TBS water. These Spinach Banana Muffins are another healthy-eating staple in my house. Sometimes I get crazy and add chocolate chips (or cinnamon chips)! Serve them slathered with a healthy amount of almond butter and you have yourself the perfect breakfast! What is your favorite healthy breakfast? What’s your favorite sneaky veggie recipe? I just made these and they were good! They weren’t that sweet at all but still tasty. My 1.5 year old loved them! I used cashew milk instead of almond milk. I made the oat flour in my nutri bullet. I will make these again for sure! I’m so glad you and your 1.5 year old loved them! I prefer a less sweet muffin for my kids (and myself)! My theory is that you can always add some nut butter or a drizzle of honey to serve if you have a child with a huge sweet tooth (like my oldest lol)! Just made these cuties for the first time and forgot the eggs! (Can you blame me though with a 11mo old scrambling at me feet rummaging in whatever she can get her hands on) Good news though, they turned out just fine!! They were moist and squishy and basically tasted like a really delicious banana bread! We sprinkled Hemp/Flax/Chia seeds on top because it looks pretty and why not add a little more nutrition to these power muffins! My little one shoveled 2 in her mouth within minutes so it’s safe to say these will now be made in big batches and kept on hand at all times. Thanks for sharing such a perfectly wonderful recipe! These are great! I skipped the sugar and just added another banana and they came out perfectly sweet and moist! Thank you Hillary! So great to know you can substitute the sugar with a banana! Can I make these unsweetened without the sugar for my 9 month old?? Hey Shannon! I’ve had readers comment that they added another banana or 3 pitted dates instead of the sugar and they still turned out great! Yes! I add an extra banana and skip the sugar. Also, the more ripe the banana, the sweeter it’ll be! Made these with brewer’s yeast, dark chocolate chips, and toasted walnuts for delicious lactation muffins! They were amazing and a big hit with my mom group! SO glad you enjoyed them Katie! Love that you made them into a lactation recipe! I make these muffins once a week! I like to add some cocoa powder and chocolate chips every once in a while to make chocolate muffins. Thank you for such a wonderful and versatile recipe that will forever be a part of my recipe box! The addition of chocolate chips sounds amazing! This is one of the first recipes I made for my son when he was transitioning to “real” food. We both loved urban and it was so easy! Still a staple for us. Yes! They are so great for toddlers! I made these few times and I can never get them texture right due to spinach not blending well. I never knew it’s so hard to blend spinach. Hence why I’m in a great need of a vitamix. I went ahead and tried replacing the spinach with one cup of apple sauce and they came out great! Love this recipe so much, both with and without spinach! Has anyone tried making these with frozen spinach? And, do you use your regular vitamix to do this or do you have a dry container? I only have the wet container. I have only used fresh spinach, but I imagine frozen would work. I use the wet container (the regular container that comes with the Vitamix blender)! Can I substitute almond flour for the oat flour? Hello Brittany! I haven’t tried substitution almond flour for the oat flour, so I am unsure how the muffins would turn out if that substitution was made! My family loves these muffins! I’ve been making them at least every couple of months for a few years! I’ve tried several substitute ingredients like swapping milks or sweeteners and they always turn out amazing. I also pack in more than two cups of spinach and they still have the same great taste. They do freeze and thaw amazing! I always double the recipe and freeze half. When we’re ready to eat them I just set the batch in the fridge over night. Currently I’m making a batch for my son’s first smash ‘cupcake’. Yay for healthy and clean ingredients for little ones! Such a big success! Im vegetarian so I added a bit of protein powder to put a bit more protein into my day! I also added some cloves and nutmeg to spice it up! Will definitely be making these regularly! YAY! I’m so glad you enjoyed them Brooke! Love the idea of adding extra spices! These are baking now and they smell amazing! I made the recipe exactly, except I only had spring mix. I used two cups of that plus added two tablespoons of wheatgrass powder. Whategrass can be really strong and it’s hard to disguise, but the batter was yummy! I can’t wait for my little guy to try the muffins! I just made this recipe and it was delicious! I used almost flour instead of oat flour, and half of the amount of sugar (<1/4 cup). They came out great!! HI! just made this and they are amazing! should I keep them in the fridge? or I can leave them outside? They’ll last longer in the fridge or freezer! Excited to try these today for my little girl (11 mo). But I only have frozen spinach. Do you think this would be ok or should I add more oat flour to compensate? I just made this recipe and my kids loved it!!! It is not always easy to have my kids eat veggies!! I gave them without telling them what was inside and they enjoyed it!! Once I told them that there was spinach inside they said “Ugh!! Disgusting!! !” Then they ask me if I could put some for their snack at school 😂😂. Thank you for this recipe really nice.